Business schools have launched countless game-changing startups—massive companies like Instagram and StubHub among them. But what do next year’s breakout businesses look like, and which business schools will they be emerging from? For BusinessBecause's MBA Startups To Look Out For, we reached out to schools around the world to discover the most promising ventures among their current and recent MBA classes. Founded by Meredith Caldwell and Liam McMorrow, Adelie Health has created the PenPal, a medication management tool that aims to alleviate anxieties for those suffering with type one diabetes. A small device that fits onto insulin pens, the PenPal allows users to track how many injections they have completed and gives them a reminder when their next one is due. How did you get the idea for your startup? Liam, our cofounder, comes at it from a personal perspective. He grew up with diabetes, and was looking for a better way of managing it. By talking to people, he realized that people were [having to inject insulin] so often, and changing one small thing would make a big difference. How did your MBA help you to start your business? We got lots of presentation practice at Oxford, which I was not good at coming into the MBA. We presented to 500 people at the Oxford Saïd Entrepreneurship Forum in March—that experience allowed me to develop personally and professionally. We’ve just won the EJP Health Award of £50,000. That’s fantastic for us to take Adelie Health to the next stage, using the funding to further develop a functional prototype, and bring that to investors in the seed round. Alpha Interview aims to eliminate bias in recruiting through Artificial Intelligence (AI). By getting candidates to undergo a video interview and then picking those suitable for progression using AI analysis of speech topics, changes in voice, and facial tracking, Larry and his co-founder Alain Illi hope to bring ease and accuracy to the recruitment process. I did my undergrad back in China, where I’m originally from. Then I went to the US for my Master’s in Statistics. After graduation I worked in the US as a consultant with Deloitte for about four and a half years—that’s when I started the MBA here in London. How is your MBA helping you with the startup? There’s really three parts to this. [Firstly,] I really appreciate the flexibility of the classes and the variety—I just pick what I want to do, and then I can use the knowledge [for] my company, which is super helpful. The second thing is the community at London Business School. When I started this company, I had to interview a lot of people in the industry, so I used a lot of connections with professors or classmates just to get those interviews. Thirdly, the alumni network. It’s really active—for example, we have a forum that all the alumni have access to. Sometimes I post a question and I’m surprised when I get an answer—I was using this as a last resort, but it was actually a really useful resource. It’s so much better than if I was outside LBS and trying to start something on my own. AmaElla is an ethical clothing brand founded by Lara Miller and Julie Kervadec. Having grown up in a family business, Lara had always had a strong interest in commerce, and spent several years working for large corporations such as Colgate. But after seeing the environmental damage caused by big industries on a conservation trip to Madagascar, she decided to pursue a sustainable career. Our business formed from a sort of personal crisis. My partner [Julie] had to visit manufacturers in China, Bangladesh, and India [for her job in the textile industry]. It’s stressful working in fast fashion—there’s a never-ending cycle of faster and cheaper. [Julie] asked her boss how they would produce such a massive volume of sweaters in two or three weeks, and her boss said, ‘Don’t ask—look.’ No one was working under proper conditions. It clicked something in her mind; she started questioning and couldn’t carry on. By that time, I’d finished my MBA in Cambridge, and we had a conversation and set up a business ourselves. [The idea for AmaElla] came up from personal frustration: it’s easy to find sporty, urban cotton underwear, or granny underwear, but we wanted something in the middle—cotton, but nice. [We decided] it had to be organic after my experience in Madagascar and [Julie’s] in fast fashion, and to stress ethical practices in the supply chain. BeeHex is a manufacturing company that produces hardware and software based on 3D printing and Computer Numerical Control (CNC) technology—all to personalize foods. They have automated dessert decoration, food toppings, and are even looking into personalizing nutrition plans. After graduating from the College of Engineering at the Ohio State University in 2005, I worked on applied research projects for NASA and the US Air Force, with Additive Manufacturing as my focal point of research. I joined Warwick Business School as a distance learning MBA student in 2011 and graduated in 2015, the same year I founded BeeHex. How did the idea for BeeHex come about? In 2012 I won a grant from NASA to develop a 3D food printer to personalize nutrition for astronauts during deep space missions such as Mars. While working on that project, I thought about commercializing this technology, and in 2015 I decided to quit my job and start BeeHex. What does the future hold for BeeHex? We see tremendous opportunities with 3D food printing. We're currently automating confectionery decoration for many large in-store bakeries in the US, but we're also working with the US Army to develop a machine that can personalize recovery bars for soldiers based on their genetics, metabolic rate, blood markers and level of physical activities. We want to commercialize this technology for the consumers—we're excited to receive initial traction in this multi-billion-dollar market. Delhicioso! is a platform connecting home chefs who love to cook to people who can’t cook at all. They offer two main services: a meal service, where professionals around the city can enjoy multicultural meals at their offices, and catering services which focus on organizers with tight budgets. Before coming to Barcelona for my MBA at ESADE, I spent around 5 years in the consulting industry. While working in the field of consulting, I met a lot of industry experts and learned a lot in different fields. However, I saw myself working far more passionately for any project in the hospitality industry. Eventually, I realized that food and hospitality is the area that actually brings joy to me and that is something which I can do without counting any hours. How did the idea for your startup come about? The idea came around back in India, where I wanted to create a community of housewives cooking food for professionals. I found a similar need at ESADE. There, I decided to ask a few students and their partners to help me, and after a few iterations, the idea seemed to work where people loved to eat something that their friends or their partners cooked. Delhicioso! now gives them the opportunity to not just share the food with their friends, but share that love with everyone in Barcelona. How did the MBA help you start your business? The immense support, knowledge and mentorship that makes ESADE has been the key to starting Delhicioso! I am extremely thankful to the management, mentors and friends (who are working with different international companies) for their continuous support and tips on how to keep getting better. Dermveda is a personalized skincare website specializing in dermatology education. Their website is tailored to each reader’s skin type and features over 1000 pieces of content written and peer-reviewed by dermatologists. Dermveda recently launched an ingredient-driven product platform that matches carefully-vetted products to skin types and product preferences. Dermveda started over my dining room table! My co-founders, now dermatologists, were experiencing a couple of constraints in training: [firstly,] lack of time with patients, [and secondly,] increasing demand for complementary medicine which was not studied in school. The public wanted to know what dietary and lifestyle modifications they could make to improve or prevent skin concerns. After assessing the market, we realized that an integrative dermatology resource that blended Western and Eastern practices did not yet exist, so we decided to build it. The MBA I received at UC Davis has been extremely valuable in establishing the functions necessary for a successful business. Everything from managerial accounting, to the ‘four Ps’ of marketing, to strategic planning, to pitching a 10-slide deck have come into play at some point in our startup's development. I also benefited from expert mentors and established a strong support network. So much so that my first hire was actually a classmate! What does the future hold for Dermveda? Dermveda recently expanded into continuing medical education for providers. We will be hosting the first annual Integrative Dermatology Symposium, which will be attended by experts from around the world and continue to expand the field of integrative dermatology. First Edventures is a startup dedicated to giving parents the practical tools and resources to give their babies and toddlers a strong start in life. With an educational program designed to optimize children’s formative years of development, the company is currently preparing for their next round of fundraising. After graduating from Columbia University in New York City, I wholeheartedly jumped into the music industry, started my own production company, and wrote over 100 songs for numerous artists, earning a Grammy nomination for Best R&B Album in 2013. With this experience, I co-founded an entertainment marketing company, IDL Entertainment Group, managing a talent roster of over 150 people and working with brands like Target, Ford and Seventh Generation. When my son was born [in 2015], I was extremely fascinated by his ability to learn and discover the world around him. I wanted to do everything in my power to support him through this time of development. However, I soon realized just how challenging the process can be. First of all, there is an overwhelming amount of advice and information available online, and secondly, most of it is not a long-term fit for the life of a busy parent. I did not come across a manageable solution anywhere, so I decided to create one. How is the MBA helping you with your business? I have always followed an entrepreneurial career path so I wouldn't say that an MBA has helped me start my company but more so grow it. An MBA has been instrumental in providing me with a more definitive framework for understanding and navigating some of the business challenges that I have come across when building the company. Additionally, my professors and the incubator program directors have been a great sounding board and resource in growing First Edventures. Gartenzwerg specialize in creating Personal Smart Gardens, enabling anyone to grow food from their home effortlessly and sustainably. No matter the limitations of time, space, or knowledge, users can connect to the Gartenzwerg app using Internet of Things (IoT) technology and be notified and instructed in real time as to the care required by their plants. During my MBA at Hult in China I learned that NASA was using hydroponics in space to grow food without soil. I thought this was amazing and wanted to have something similar for my home as I’m terrible at keeping my plants alive! After some research, I couldn’t find anything that was easy to use and would fit nicely into my home, so I decided to build one myself. I pitched the idea to Andre, with whom I studied during the MBA—now he’s my founding partner and COO of Gartenzwerg! Entrepreneurship is at the core of [Hult’s] values and everything they do. Entrepreneurial skills and qualities are important for startups and corporations alike as they give you the tools to not only manage but create and innovate. All the courses encourage an entrepreneurial environment and combine theory with praxis. The Hult Business Challenge is a great example. It is an intense four-month project and part of the one-year program where you can choose between a corporate and an entrepreneurial track. I picked the entrepreneurial one and for me it was the best learning [experience,] because you get a very good flavor of all the challenges startups face, while being within a safe environment. Gocerii is a meal delivery service aiming to tackle the problem of food waste among ‘Generation Rent’. 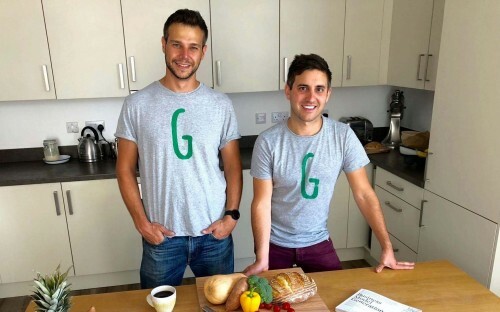 With 13 million UK adults now living in shared accommodation, Gocerii offers a flexible alternative to meal-box services and supermarkets that force consumers to buy food individually. The startup offers shared meal planning through recipes that can be personalized according to diet, complete with cost-splitting methods for easy communal eating. Tell us about your career journeys. Simon: I worked at multiple startups coming out of the Rocket Internet startup incubator, including Hello Fresh. After that I joined Future, a media company where I headed up the strategy of its ecommerce division. Chris: I joined Dyson as a graduate in 2012, and moved up through various roles covering digital, product strategy and marketing. A year before starting the MBA I moved jobs and went to the RAC to oversee upselling to existing members. The ‘theme’ that’s tied my career together is engineering—figuring out how things work, spotting problems, and solving them. Simon: Like all good ideas—over a beer! We knew we wanted to do something with food, and originally wanted to focus on personalized nutrition plans. But as we worked through it, we realized we were trying to solve acute problems with an overly generic product. The answer was staring us in the face: we’d both gone back to being students for the year, and were living in shared accommodation! Chris: I’d lived in shared accommodation in Bristol for several years so this really made sense to me. I’d lived with some keen cooks, but we’d only cook together once every couple of weeks. The fridge was always full of ‘too much of something’… There had to be a more efficient way for us to buy exactly what we needed to feed ourselves in the evenings! Simon: Having worked at Hello Fresh and being a user of multiple different food delivery boxes, I always felt they could be done better. If you were to have one night where you can’t cook, food goes to waste from the box, so unless you have a really rigid routine these boxes just don’t deliver what they promise. Having shared the boxes with friends in the past, this makes it really difficult to ensure everyone is happy to eat the recipes. Hypercrunch is a social media reputation service for small and medium-sized enterprises (SMEs), offering a flat fee per month that covers social media, email marketing, reputation management, website chat-bots, reporting, and even influencer marketing. How did you get the idea for Hypercrunch? Since I started at Cass I wanted to start my own company. Initially, I wanted to start my own consulting firm, but when I arrived at the step where I wanted to get some coverage online, I asked, who’s going to handle my social media? I did some research online, and I found no-one covering the entire scope—social media, email marketing, PR, etc. Surprisingly, everyone told me ‘Either we do it ourselves or we don’t.’ They weren’t necessarily the people qualified for the task. It was really interesting to see this. The other option was to hire freelancers—but there’s a lot of uncertainty in this area. And there was no-one in the middle—nobody is targeting the SMEs of today. How did Cass help you to launch your startup? Cass has a lot of services and elements that [give] students the drive to start their own companies. There’s the CitySpark, an incubator for startups where you can have a desk—going there, talking to startups, that kind of environment is really key. The second thing is that they have a lot of support, in terms of opening up opportunities and networking. You really have an added service to your MBA. It’s all this kind of support that is key when you start. Kinima is a virtual fitness station that uses AI to guide its users through their workouts independently. Using 3D camera technology to track movement, Kinima acts as a virtual personal trainer, giving real-time feedback and visual analysis. How did the idea for Kinima come about? Dan: I did my undergrad at the University of Pennsylvania, and it came out of my senior thesis. I got an undergraduate business degree but I was also an engineer studying to do science. Back in undergrad I was an athlete—I played squash—[and] we would always do a ton of video analysis on our performance after every game. Of course someone who loves computer science is going to want to automate that! Even back then, the big thing for me was that you shouldn’t have to wear anything—you should just walk onto the court, and you’re tracked. Then when I graduated I felt the pain point that everyone else did—I’d go to the gym, my workouts would take forever, and I did the same workouts over and over. I wanted to solve my own problem. How did the MBA help you get the business started? Naicheng: I think business school provides an incredible ecosystem to be able to start your own company—starting off with the wealth of resources. We’ve been connected to many very successful and experienced investors and entrepreneurs who can guide us along the way and provide mentorship. Oftentimes when you go into a startup you don’t even know what you don’t know, and it’s helpful to have people coach you along the way and be really motivated by your success. YPB creates wholefood bars designed to provide fuel for each stage of exercise. Using input from Olympic coaches, athletes, sports doctors, and nutritionists, and based on simple parameters entered by the athlete, YPB deliver the ideal mix of bars to get the best results from training. The idea for YPB grew out of the Entrepreneurship module of the MBA program, when our team were brainstorming ideas. We felt that the sports nutrition market was rapidly changing. We saw that a section of consumers are becoming increasingly active, concerned over the environmental impact and ethics of animal-based products, and aware of the health impact of their diets. Another set of consumers are looking for their nutrition questions to be answered and personalized by credible sources rather than relying on the numerous and conflicting messages that exist in current media. We spent months preparing and developing a patentable technology and integrated solution for real time feedback and personalised sports nutrition tailored to each user. What are your future plans for YPB? Our focus is on the endurance athlete and vegan fitness communities right now, so that we can concentrate our efforts. We are moving our website from beta test to a polished product, while also engaging events, social media, as well as online and bricks-and-mortar retailers. Our big plans, however, are really exciting! Having filed our patent we are moving forward with our plans to personalize sports nutrition predictions and feedback for each person. We expect to be testing it with some of our athletes by the Dublin Marathon at the end of October, before larger roll out in the new year. nearfarms is an online marketplace for fresh, local produce. Working with independent farms in the San Francisco Bay Area to help producers sell directly to consumers, nearfarms offers an easy-to-use online platform, plus marketing and delivery management for farmers. For consumers, it’s a way of getting farm-fresh produce delivered to their doorstep. How did the idea for nearfarms come about? I met my co-founder Surya, another graduate student at UC Berkeley, in my first semester and we discussed our shared interest in going to farmers’ markets. However, we also noticed that farmers’ markets don’t satisfy all the needs for consumers looking for convenient access to fresh produce. The idea for nearfarms came about as a way of expanding this access and making it easier for customers. Being at Berkeley-Haas has tangibly helped me launch nearfarms in many ways. Surya and I met through an entrepreneurship mixer for a Haas class. We went through an on-campus accelerator program (LAUNCH) that has been instrumental to our progress and development as a company. Additionally, I’ve always had easy access to professors for mentorship or advice whenever I’ve needed it. I’ve also been fortunate to receive our Dean’s Seed Fund that provides grant funding for student entrepreneurs. Our key future milestone is growing both sides of the marketplace and scaling the business. This is critical to improving our unit economics and setting us up for geographic expansion. We currently operate only in parts of the Easy Bay and we naturally want to expand. Tactically speaking, this involves developing more distribution partnerships and broadening our marketing efforts. We’re also always working on improvements to the platform based on user feedback. Quidli is a blockchain protocol designed to allow companies to transfer equity in just one click. The company’s first application on top of this is a future of work platform for projects and companies to trade work for equity, meaning companies can pay workers in future equity instead of cash upfront. Quidli even used this model to grow themselves, working with more than 20 contributors in 6 months, while maintaining a low burn rate. My co-founder, a colleague at HEC, used a work-for-equity system to bootstrap his previous startup (a hardware company) despite having no cash or workforce at the beginning. He wanted to build a SaaS [Software as a Service] product around this concept and so he reached out to me due to my experience in Internet and SaaS businesses. Together, we established the foundation for a simple and legal framework that could address the challenges that entrepreneurs, founders, and CEOs face when building a company. Our big vision is to address the future of work. Ultimately, we want our protocol to be the foundation for tech solutions that help doers become owners of their work. Quidli was selected to participate in the first cohort of Tachyon, ConsenSys' new blockchain accelerator in San Francisco, where we receive backing, mentorship, and workshops with some of the leading figures in this space. Now, our future plans have become even more ambitious—to become an integral part of the growing Ethereum blockchain ecosystem as a whole. Resprana is an in-nose air filter that aims to protect against air pollution as mankind continues to rely on fossil fuels. A silicone air pod with an activated carbon filter to remove dust and the most common elements of air pollution, Resprana offers a sleeker, less cumbersome alternative to the traditional filter mask. How did Resprana get off the ground? I saw the 300k New Venture competition 2017 for entrepreneurship in my final year at NYU Stern and thought I might as well take advantage of all the great resources that are on campus and enter. I arrived with a different startup but after meeting Sophie Frank, another really passionate NYU student, I wanted to get involved with Resprana. The company is built around improving the world and that’s something I’m passionate about. Holistically, I think the MBA helps you think bigger picture. Where a lot of people get caught up day to day, going from task to task, an MBA helps you view business and society on more of a global, long-term scale. You are encouraged to think about where various industries and sectors will be in the future, what are the trends that we can see emerging, and to see society and business from a birds-eye view. Rock Stone Silk is a luxury designer based in the UK, using digital printing to create designs based on microscopic sections of rock samples. From silk scarves to tiles, the company has 24 designs registered, and is looking to expand further with an autumn/winter range in late 2018. How did the idea for Rock Stone Silk come about? I used to work in the oil and gas industry and used to do a lot of work with micriscopes, so I just had this idea one day. It’s only really in the last year that I’ve gotten involved in graphic design and started building on some of the images, and I produced this catalogue of quite intricate, quite stunning designs. Because of digital printing, it’s really easy to get almost anything you want translated onto every surface, so I had some printed onto silk scarves and they just came out [beautifully]. How did the MBA help you start your own business? The marketing module has been worth its weight in gold—trying to understand our audience, trying to find a balance between trusting your gut and [consumer] feedback. I [also] used an exhibition to do a soft launch for the business back in May, at Make It British Live in London. The feedback from that was very positive and very constructive; what I gathered from it was that we have a very strong brand, but maybe the message was lost in that people thought we were just selling scarves, or printing designs when in fact we use a third-party supplier. The Skeww is a one-of-a-kind news site that uses AI and natural language processing to scrape the internet for the most important news stories of the day, and then curate the best commentary from both the political Left and Right. Each article is assigned a score based on partisan bias, before a team of writers create summaries for each side. Where did the idea for The Skeww come from? Keal [Harter, Sean’s co-founder and MBA classmate] is a former naval intelligence officer, he worked on the Hill, and I’m just really interested in the news and politics. We disagree on a lot of issues, but we have really great conversations. [Whereas], the type of [political] discourse that you’re seeing [in the US] is really poor. There’s not a lot of fact, there’s a lot of name-calling, there’s not a lot of analysis—and what’s contributing to that, in large part, is social media and algorithms that are designed to please us. What Keal and I realized was that in conversations that we were having, we were disagreeing but we were having constructive conversations, and that was where the idea was born. We thought, is there a way to replicate the experience that we’re having here online. How did the MBA help you in setting up the business? I was an entrepreneur before coming to Tuck, and I just did everything wrong! What Tuck did for me is two different things—number one, it introduced me to a new way to think about entrepreneurship. I participated in a number of academic classes and more practical classes as well, that taught me about the lean startup method. And then you have a ton of great resources. Your classmates, your professors—everyone knows someone who has experience in an issue that you’re looking into. Dartmouth has something called the DALI lab, which is a centre in the school which has both undergraduate and graduate computer science students in. What we did was use the lab, and have the students help us when we got stuck with more difficult technical problems. I'm An Entrepreneur—How Do I Compare To An MBA Applicant With A Corporate Background?